The team that developed a ground collision avoidance system has won the prestigious award. A joint effort by Lockheed Martin, the U.S. Airforce, NASA and defense officials led to new lifesaving technology for the F-35, and on April 5, the National Aeronautic Association announced that team as winners of the 2018 Robert J. Collier Trophy. The Automatic Ground Collision Avoidance System (Auto GCAS) Team has been named the recipient for "successfully completing a rapid design, integration and flight test of critical, lifesaving technology for the worldwide F-35 fleet,” according to association officials. 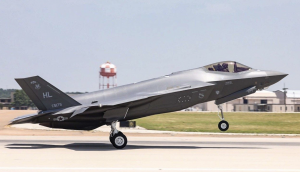 As the name implies, Auto GCAS technology uses automation to prevent an F-35 from hitting the ground. "The Auto GCAS team, which includes Lockheed Martin, the U.S. Air Force, the F-35 Joint Program Office, NASA and the Defense Safety Oversight Council, is a sterling example of a project that brought together the best minds from many disciplines," said Greg Principato, National Aeronautic Association president and CEO. The Collier Trophy is awarded annually “for the greatest achievement in aeronautics or astronautics in America, with respect to improving the performance, efficiency, and safety of air or space vehicles." The Collier Trophy Selection Committee, comprised of 30 aviation and aerospace professionals, convened on April 4, 2019 to hear presentations from 11 nominees. This year’s nominees included the Bell V-280 Valor, Boeing T-X, Embraer E190-E2, F-35 Integrated Test Force, NASA/JPL Mars Cube One (MarCO) Project Team, Perlan Project, Virgin Galactic SpaceShip Two Program and others. Last year, Cirrus Aircraft won the trophy for "...designing, certifying, and entering-into-service the Vision Jet - the world's first single-engine general aviation personal jet aircraft with a whole airframe parachute system." Plane & Pilot was thoroughly impressed with the Vision Jet. Check out an overview of this "single-engine, single-pilot jet with a Boeing 787 level of technological sophistication" by clicking here.